I just added a couple of Harris Tweed Patchwork Satchels to the Pesky Cat Designs shop. I created the flap using several different Harris Tweed checks and added a large button to finish them off. The adjustable strap is made from luxurious velvet. Inside you will find one zippered pocket, one slip pocket and a swivel key clip to keep your things organized. These satchels are one-of-a-kind items. I'm all out of Harris Tweed at the moment. I recently placed an order from my source in Scotland which I hope to receive soon. For the next few weeks I'll be creating bags made from corduroy, heavyweight linen and canvas. On that note, I'm off to the studio. See you soon! Merry Christmas! And wishing you much peace, health and happiness in the coming New Year! Today we took a walk downtown and visited the Mission of Nombre de Dios which traces its origins to the founding of the City of St. Augustine, Florida, America's oldest city, in 1565. It was at this sacred spot that the Spanish settlers would begin the devotion to the Lady of La Leche that continues into the present. This will be our first Christmas in beautiful St. Augustine. I want to wish all of you a joyous Christmas and much peace, health and happiness in the coming New Year! I recently completed an Offbeat Messenger inspired by a sweet kitty. Her name is Anni and she is the pesky cat of Pesky Cat Designs. She was rescued from the streets of NYC on a very cold winter day. The shelter we got her from listed her as "little orphan Anni" and she was about 9 months old. She lived with us in NYC for 8 years in an apartment on the 10th floor. She was not fond of our front door since it only lead to a hallway with two noisy elevators. Now she lives with us in Florida and loves the front door. It leads her directly to the outdoors where she can chase butterflies, little lizards and other fun things! The bag is adorned with handmade appliques designed by me, hand cut and machine sewn onto the bag. And its interior is lined with happy kitties! The Pesky Cat Designs shop now has bags available in denim and velvet! I've got a limited quantity of these textiles available at the moment but plan to order more very soon. I received swatches of velvet in different colors from my supplier and now need to make my selections. The denim I selected is a classic dark indigo. The purse pictured below is made from cotton velvet in swedish blue. I'm loving this soft grayish blue. It's adorned with a wool felt flower applique and a coconut button. Both these purses are now available in my shop. Yesterday I added a Harris Tweed satchel and messenger to the shop. More Harris Tweed and velvet coming this week. Christmas Shipping Update: All US orders ship within 48 hours via USPS Priority Mail Service with Delivery Confirmation that can be tracked online. Packages typically arrive in 3 days. Today I want to share with you a few of my favorite Etsy purchases. Clockwise from top left, Cute EcoVintage Cap in Grey Linen by Sandrine Marsh, White Sea Glass and Sterling Silver Seahorse Earrings by Sea Glass Designs, Little Leaves Embroidered Pendant Necklace by Edward and Lillyand Balance - Mini Art Feeling by Art Mind. Not only are the creators of these beautiful items super talented, but they are also super nice! In the next week I'll be adding aviary inspired bags, purses and wristlets to the Pesky Cat Designs shop. Right now in the studio there are several Harris Tweed bags in production. I'll also have more items available in the cool retro-look owl print cotton canvas. If there is something that you like that has recently sold just contact me via the shop. In most cases I can set up a custom order for you as long as I have the fabric in stock. Wishing you all a wonderful Sunday and week ahead! Yesterday I added 6 wristlets to the Pesky Cat Designs shop and completed the Holiday Boot Camp Challenge! The challenge began on October 2nd and was to have 100 items in my shop by December 1st. At that time I had 40 items in the shop so I needed to complete 60 more. Thanks again Damjana of Loddelina bags for coming up with this great idea to motivate ourselves to work hard. It was my pleasure being you holiday boot camp buddy! And this morning Etsy celebrated the news by featuring my work on their front page. Just kidding about Etsy celebrating, but I was on the front page! Today until midnight all items in the Pesky Cat Designs shop are 10% OFF including sale items. Use coupon code "HOLIDAYS" during checkout. I recently added new Satchels to my shop with bird and flower appliques. They all have adjustable straps, two interior pockets and a swivel key clip. In case you miss this sale stay tuned to my blog for other promotions in the near future. The Boot Camp update: Three more items to go! And in case you missed it, Thea and Sami did a feature on me and my work. Thanks again Thea! The Pesky Cat Designs shop is having a weekend holiday sale! To claim your discount use the code "HOLIDAYS" during Etsy checkout for 10% OFF everything in the shop from now until midnight Cyber Monday, 11/29/10. Shop update: I'll be adding a couple of Satchels, including the one posted above, to the shop in the next hour or so. More Satchels coming soon! Below is a shoot of Anni this morning. She spent the past 8 years in a NYC apartment on the 10th floor. She was never fond of the front door since it only lead to a hallway with two noisy elevators. Since we moved to Florida the front door is her best friend. It leads to a patch of grass that she loves to eat, butterflies, little lizards, birds, squirrels and lots more! 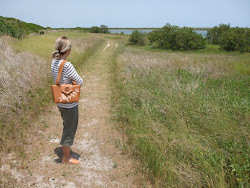 If you head over to Thea and Sami's blog you can catch the latest Friday Follower post featuring me and my handmade bags! Thanks so much Thea for putting together such a lovely feature. Thea is a textile designer and fabric printer who lives and works in Brisbane, Australia. I've been following her blog for quite some time and her creativity and energy always gives me so much inspiration. Thea and Sami design and hand screen-print natural fabrics for home and body. Their growing range of products includes a boutique of eco-friendly homewares. You can check out her gorgeous fabric and products at the Thea and Sami store. Shop notice: I should have some new bags in the Pesky Cat Designs shop tomorrow just in time for Black Friday. I also have a selection of bags on sale to celebrate the upcoming holiday season. I'll be adding a few Harris Tweed purses to the Pesky Cat Designs shop in the next hour or so. I've got two Semi-Circle Purses and one Wayfarer Purse to list. Later today I'll be cutting and preparing fabric for new bags. And of course I will take some time off to relax and enjoy this beautiful day here in St. Augustine, Florida. Wishing everyone a wonderful weekend. Enjoy! Yesterday I posted a glimpse into my studio with my recent work in progress. I needed interface in order to complete the work and was waiting for my supply to be shipped. Later that day it arrived! And today my second backup shipment arrived so I am well stocked for the next month. I completed three new corduroy purses and should be able to finish a few more today. The purses pictured above will be listed in my shop today. Wishing everyone a wonderful Friday and weekend ahead. Below is a glimpse into the Pesky Cat Designs studio this morning. It's my favorite time to work since I love the sunlight that streams in and it always puts me in a good mood. I don't like to work with artificial light so I need to get up early to get a days work in. Lots of new bags are currently in production at the studio. I'm waiting for a shipment of heavy weight sew-in interface to arrive before I can complete them. It's on backorder from my current vendor so I purchased some from another source hoping that one of my orders will arrive soon. All my bags are made with a heavy sew-in interface to give them shape and durability. Also, my interior fabric and exterior fabric is interfaced with fusible stabilizer. So the bags all have three layers of interface. I'll keep you posted on when the new batch of bags are completed! In case you missed my original post, the Holiday Boot Camp Challenge is to have 100 items in the shop by December 1st. That goal was set on October 2nd at which time there were 40 bags in thePesky Cat Designs shop so 60 more needed to be created. The idea came from the very talented Damjana of Loddelina bags. This challenge is not a competition, just a way to push ourselves to work towards a goal. During the holiday season it is good to have as much inventory as possible in your shop and this challenge has really helped me focus and work toward my goal. There are 16 more days left until December 1st and I still need to create 22 more items. In the next couple of weeks I'll have to find the perfect stride to gallop to the finish line! Here's a little sneak preview of the new Woodland Collection of Harris Tweed wristlets that will be available at the Pesky Cat Designs shop soon. The appliques were handcut from a free hand drawing so no two are exactly alike. Each wristlet is fully lined with a floral cotton print fabric and has one interior slip pocket large enough for credit cards or cash. The strap is lined with the same fabric as the interior so it's soft against your wrist. These wristlets will be available in corduroy as well. They are the perfect size to store all your essentials so you can leave your purse behind! I think gray is a perfect neutral that will go with just about any color outfit. I can picture it paired with shades of fuschia, black, red, dark navy and mustard to name a few. The purse above is made from Harris Tweed wool in a medium gray with a light gray wool felt applique and a wood button. I recently purchased some wool felt and it is perfect for making appliques with. I ordered quite a few colors so I can experiment with different shades. 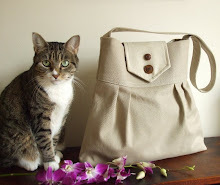 Yesterday I added a couple of bags to the Pesky Cat Designs shop including the purse shown above. More bags will be added this afternoon. For anyone that is interested I am now taking custom orders. See my shop policies for more information. This week I will be working on a new collection of Harris Tweed wristlets. Stay tuned! The Macleod check is one of my favorite Harris Tweed weaves. Tones of blue, green, brown and touches of yellow and red. Did you know that the definition of Harris Tweed is enshrined in law, with clear legal criteria laid down in the Harris Tweed Act of 1993? To meet the legally-prescribed definition of Harris Tweed it must have been "hand -woven by the islanders at their home in the Outer Hebrides and made from pure virgin wool dyed and spun in the Outer Hebrides". Amazing. I just added a Wayfarer Purse to the shop made from this iconic fabric. A messenger and a Jewel Cut Purse in Macleod check is coming soon. And in case you missed it, come check out my first YouTube video featuring my bags on the beach! Today I packed up some of my handbags and headed down to the beach for a photo shoot. The weather was perfect. 85 degrees and sunny with a nice breeze coming from the ocean. I also had a video shot and hope to post that here sometime soon. Hope everyone had a wonderful Sunday. Wishing you a great week ahead. A Harris Tweed handbag in ocean blue tones. I just added seven new Harris Tweed bags to The Pesky Cat Designs shop. Wayfarer Purses and lots of wristlets. Come peruse them all here! The Holiday Boot Camp Challenge Coutdown: 38 more items left to create by December 1st. See this post for the scoop! I'm working on a collection of Harris Tweed Wristlets that will be available in the Pesky Shop Designsshop very soon. Harris Tweed is a luxury cloth that has been handwoven by the islanders on the Isles of Harris, Lewis, Uist and Barra in the Outer Hebrides of Scotland, using local wool. I import my supply from a lovely shop located on the Isle of Harris. The wristlets will be available in a range of tweeds and applique designs. I will also be taking custom orders. They are sized at 8.5" wide, 5.5" tall and 1.5" deep and have ample room for all your essentials. Each wristlet is lined in a pretty cotton floral fabric that coordinates nicely with the tweed. I also lined the inside of the straps with the same fabric so it will feel soft against your wrist. If you have been following my blog then you know how fond I am of Harris Tweed. There really isn't anything that comes close to it. You really have to feel and see it to appreciate its beauty! Yesterday I spent most of the day photographing new handbags and also re-shooting older bags to give them a fresh start. The new bags are now available in thePesky Cat Designs shop. Wristlets are coming soon as well as more clutches. I placed an order for Harris Tweed wool from Scotland last week and I can't wait for it to arrive. In the meantime I am working with my supply of cotton corduroy and faux suede. Below is a shoot of my studio taken last week. It's a bit less organized right now but in full activity! I just added six new clutches to the Pesky Cat Designs shop! It was a clutch factory here at the studio for the past two days. These are generously sized at 8.5" wide, 5.5" tall and 1.5" deep. Plenty of room for a small wallet, glasses, keys, cell phone and a lipstick or two. I use mine all the time. I still have more completed that need to be photographed later this week. Hope everyone is having a good weekend. Enjoy! I just added four more bags to the Pesky Cat Designs shop so all I have is 56 more to go by December 1st! See my last post for the scoop. 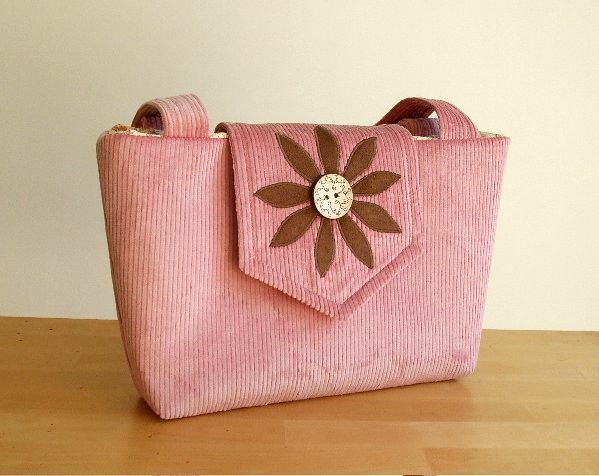 Posted above is a new purse I created in a lovely dusty rose corduroy. I decided that a truffle brown applique would work perfect against the rose. I am still awaiting the rest of my corduroy shipment that I ordered last week. Some of the fabric is on back order so I will have to be patient. I do miss being able to walk to the NYC Garment District from my apartment and have 40 or more corduroy fabrics to choose from just in one shop! This time of year my corduroy collection is always in demand. I love working with this textile which has a soft almost velvet look with a more casual appeal. I recently ordered a batch of corduroy and I am eagerly awaiting my shipment. On another note, my very talented friend Damjana of Loddelina bags came up with an idea to give ourselves a push for the holiday season. We have both agreed to have 100 items in our shop by December 1st of this year. Since we both have about 40 items in our shops right now we need to create 60 more by then. I look forward to the challenge. Get ready, set, GO! Inspired by a St. Augustine sea breeze. Enjoy. For more inspired mosaics go to ArtMind's blog and join the fun. I did! Inspired by beach cottages and seaside towns, I decided to purchase cotton ticking and create a collection of bags with this classic fabric. I lined the interiors with a sweet vintage-look cotton print in cream with tiny roses. The straps are made with heavyweight cotton webbing in cream. These bags will be perfect to take with you on a cruise or a trip to a seaside town. Perhaps a Greek Island?! They will be available in the Pesky Cat Designs shop this afternoon. Stay tuned.